I'm not much of a crafter. Ok, maybe I was a scrapbooker for 10+ years but when it comes to projects, I'm definitely challenged. 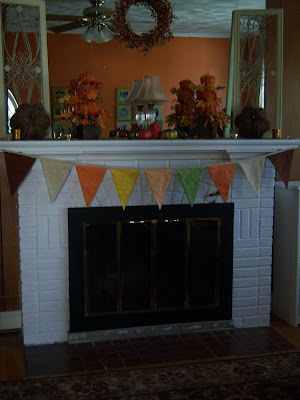 I'm not quite sure what drug I was under the influence of when I decided to make a fall pennant flag for my fireplace. (lol) Being craft challenged is one thing, but thinking I could actually sew something had to put me in the certifiably crazy category! To understand you would have to see how long it takes me to sew a button on a shirt. Believe me, women have given birth in less time! Not too shabby for a girl who can't sew, huh? It's not perfection, but I'm still shocked I pulled it off at all. well i personally LOVE IT!!! I would just love to see the inside of your house. you need to give a lil photo tour... the lil snippets just aren't enough. and even if you don't know your way around a sewing machine... you CERTAINLY know your way around some decoratin! LOVE IT! Gina you're so cute! I love this post. You did awesome. Great job! I believe that the best way to learn is just to do it...trial and error method. LOL. 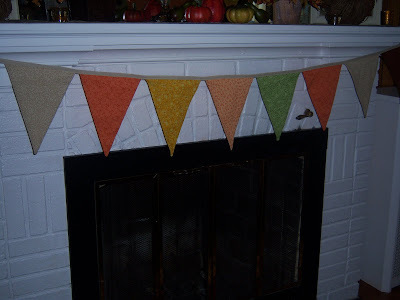 But you're pennant flag turned out great. There is surely more satisfaction when you make something with your own two hands. Right? :-D Have a great evening. very cute! came over from kims. You did a beautiful job with your banner! Because I don't sew, I've only made paper ones, lol! Great job!